At Advanced Environmental Services, we offer concrete grinding services including diamond grinding and shot blasting for concrete floors. We have a broad selection of diamond grinding equipment to handle any size job large or small. Our concrete grinding services offer the use of a dust suppression system, which is essential for concrete grinding performed in medical and pharmaceutical manufacturing plants. If you have been looking for a company that can offer professional concrete grinding services for your flooring, please feel free to contact the specialists at Advanced Environmental Services to learn more about our complete flooring services for commercial and industrial clients. Concrete grinding is a general term that refers to removing a concrete surface or layers of concrete. This service can be performed for a variety of reasons including when preparing concrete flooring for a new flooring installation project or to improve safety and promote better drainage in uneven floors. Shot blasting is similar to concrete grinding, however it requires the use of small steel balls to remove the top surface layer of concrete or to remove dirt from this top layer. The following are some of the main reasons that industrial or commercial clients will use our shot blasting and concrete grinding services on interior and exterior concrete surfaces. Remove floor coatings and old flooring surfaces: Concrete grinding can remove old flooring and floor coatings including the glue left behind from tile and carpet removal, epoxy and rubber flooring floor surfaces, paint, and grout from ceramic or stone tile. 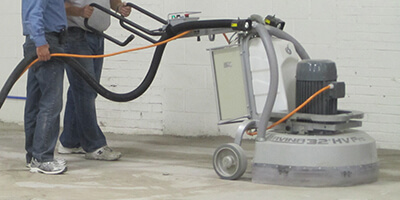 Prepare surface for polishing or staining: Using diamond grinding equipment on concrete floors can be the first step in creating a smooth surface for polished concrete or stained concrete floors. 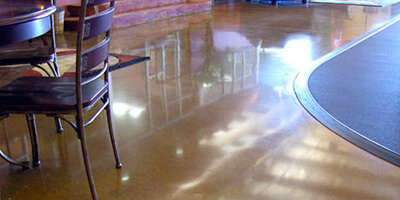 Learn more about our Concrete Staining and Concrete Polishing services. Prepare concrete for new flooring installation: Prior to most flooring applications, it is important to prepare the concrete sub floor surface. Shot blasting and concrete grinding can smooth uneven surfaces and can remove dirt, oil, and other debris from concrete floors. At Advanced Environmental Services, we offer concrete grinding and shot blasting in preparation for the installation of any flooring surface including hardwood floors, tile, carpet, and epoxy floor paint. Create a level flooring surface: In some circumstances, flooring will rise up in certain areas creating an uneven and potentially dangerous surface. When flooring raises unevenly, it is important to hire concrete grinding specialists in order to reduce and eliminate trip hazards, to allow doors to open properly, and to promote good water drainage. Clean flooring to remove dirt or debris: Shot blasting and concrete grinding can be used to remove dirt, oil, glue, and other debris from factory, warehouse, and manufacturing plant floors. With our dust suppression systems, these services are perfect for nearly any application including in medical and pharmaceutical laboratories or manufacturing and packaging plants. Our concrete grinding and shot blasting services are perfect for any commercial or industrial concrete floors including interior flooring in manufacturing plants, commercial kitchens, food preparation areas, pharmaceutical plants, warehouses, pet care buildings, medical offices, and more. If you are interested in our concrete grinding services for your commercial or industrial building, please feel free to contact us at Advanced Environmental Services today. Our flooring experts will be happy to help you understand more about our concrete grinding and flooring services and can explain how these services can meet your business’ needs.